Is it enough in God’s eyes to be a “good person”? Why do we need a “savior”? These very important questions get Bible-based answers in this book. Why Do We Need a Savior? describes—directly from God’s Word—why human beings are separated from God and in desperate need of salvation. And that’s just as true for “good people” as well as the “bad guys” we so easily identify. Built on familiar verses such as Romans 3:23 (“For all have sinned, and come short of the glory of God”) and Romans 6:23 (“for the wages of sin is death; but the gift of God is eternal life through Jesus Christ our Lord”), yet drawing support from passages throughout scripture, Why Do We Need a Savior? will encourage those already in the faith while challenging others to accept God’s free gift of salvation. 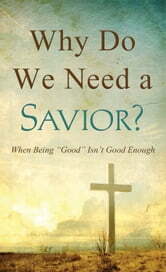 Books related to Why Do We Need a Savior? The LORD Said, "Tell My People!" So I Will!